Hannover, Germany－March 7, 2012－ At the CeBIT 2012, Thermaltake Group with its three brands－Thermaltake, Tt eSPORTS, and LUXA2 (Booth number: Hall 17, E60) not only captures visitors’ attention with fascinating products and technical innovations, but enthrals with an art object as well. 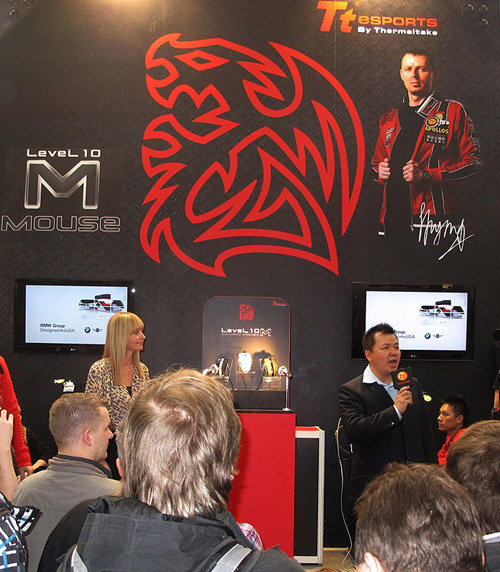 The highlight of the opening day on 6th of March was the debut of the the “Level 10 M Gaming Mouse” －the design collaboration between Thermaltake and BMW Group subsidiary DesignworksUSA, celebrates its world premiere in Hannover. This remarkable masterpiece which set benchmarks for optimum functionality and innovative details, also demonstrate the brand’s expertise in e-Sports technology. The stars at CeBIT 2012 include : Thermaltake －The new “Level 10 GT Battle edition chassis”, The “Water 2.0 liquid cooling series”, as well as the new “Toughpower Grand Platinum Snow” extension of Toughpower Grand Series that received the honorable renowned awards of iF, reddot and Taiwan Excellence awards, are been showcased at CeBIT2012; Tt eSPORTS － presents an entirely fresh look, with the new e-Sports fashion style headset － “DRACCO” under Chao family that comprehensively adapt to the cultures of e-Sports but also the culture on the streets, with six different styles and colors, the “MILITARY GREEN series” with gaming mouse, keyboard and headset; LUXA2 －”BT-X3 Bluetooth Stereo Headphone” and “High Capacity Battery & Charger”…etc. The new models from Thermaltake, Tt eSPORTS and LUXA2 delivered a strong impetus for carrying the corporate vision of “building Thermaltake Group into a cultural brand for the enjoyment of entertainment, e-Sports, technology, and lifestyle” and for the future of the brand as a whole. Thermaltake prepared to amplify enthusiasts’ game time by showcasing a succession of gaming’s amity from Level 10 GT Battle, ARMOR REVO, Level 10 GTS, Hover, Water2.0 Liquid Cooling Series, Frio Extreme, Toughpower Grand Platinum Snow, Toughpower XT 1275W Platinum Snow, SMART Series to other new cases, coolers, power supply units and accessories. The new Level 10 GT Battle edition encompassed the greatnesses of the original Level 10 GT, plus the special military print, logo and instruction designs guarantee to take enthusiasts gaming experiences to a new level. The AROMOR REVO is a full-tower equipped with wing shaped aluminum front bezel, breath light effect, USB 3.0, top-mounted HDD docking station, advance cable management, tool-free bay designs, combat headset holder, and heightened foot stand. More, ARMOR REVO will support VGAs up to 33cm long and is designed to be liquid cooling ready, is a revolutionary chassis that unite the current gaming trend with one of Thermaltake symbolic chassis – the Armor. The Level 10 GTS is a mid-tower version of Level 10 GT. It has equipped USB 3.0 front ports, EasySwap HDD bays and HDD security system, advanced cable management, excessive ventilation options with built-in dust filters, tool-free drive locking devices and combat headset holder. With the help of, FaceCloud software which can instantly turn PC into a NAS that is available and free for users’ download. The Level 10 GTS may be small, but it will definitely provide the versatility enthusiasts crave for. The name BigTyp Revo downfacing air cooler with military theme is equipped with a powerful 12cm PWM function fan, large high density aluminum heat-sink fins, five of six millimeters heat-pipes grant the ability to support up to 150W of heat dissipation. 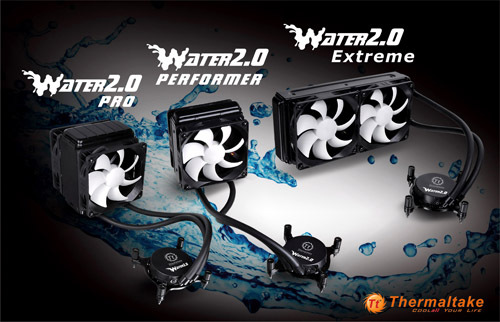 The Water 2.0 liquid cooling series include three types of all-in-one coolers, Performer aiming towards entry-level gamers with a standard size radiator, Pro aiming toward mainstream gamers with a standard radiator but twice as thick as the Performer, and Extreme twice as big and 1.5 thick as the standard radiator for enthusiasts. All have a special designed dual automatic adjustable 120mm PWM fan with the speed between 1200RPM to 2000RPM, a powerful and agile pump and a copper base plate, ready to take on any specific system. Further, the Frio Extreme which has a maximum cooling capacity of 250W guarantees to deliver the desire performance when needed. 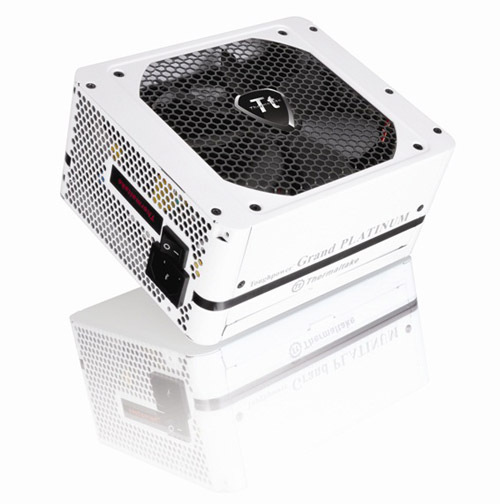 Thermaltake would present the world’s first high-end Toughpower XT 1275W Platinum Snow Edition and the new Toughpower Grand Platinum Snow Edition the extension of iF, reddot and Taiwan Excellence awards winner of Toughpower Grand Series, as well as the budget saver SMART series for all types of system. The Toughpower XT 1275W Platinum Snow and Toughpower Grand Platinum Snow come with white braided flat cables which can deliver up to 94% high power efficiency. Featuring the Full Bridge and LLC resonance with DC-DC module and interleaved PFC circuit, 100% 105°C Japanese electrolytic, solid capacitors, massive +12V rail(s) support up to 4-way SLI ™ and 4-way Crossfire™. Plus, the unique S.P.T (Standby/ Power good signal/ Temperature) LED indicator specially designed for Toughpower XT to verify the PSU status, and the built-in 14cm dual ball bearing fan with three modes Smart Fan Control system (Fanless mode, Silent mode, & Cooling mode) that automatically detects the PSU ambient temperature and adjusts fan mode & speed to create the smooth airflow and achieves the optimal thermal performance. Tt eSPORTS, the leading expert in professional e-sports gaming and the best choice for pro-gaming products, is ready to present the latest and most exciting products at CeBIT 2012. Tt eSPORTS is now prepared to launch a new product line: DRACCO headset series. Recently revealed at Taipei Game Show 2012, DRACCO headsets attracted both gamers’ and music enthusiasts’ curiosity about the sound and the Tt eSPORTS CHAO designs. Influenced by the emerging awareness of fashion cultures, the word Chao is now referring to a particular life style or social practice, often in forms of street fashion and behaviors. From the way you dress, to the choice of night life and your way of lifestyle in general, Chao is also a tribe with people imbuing a variety of artistic and street cultural elements in virtually everything. In 2012, Tt eSPORTS is ready to launch DRACCO headset series in three different categories: DRACCO, DRACCO Signature, and DRACCO Captain. Each category serves different gamers/musicians, and for the passion of First-Person-Shooting game, the DRACCO Captain is equipped with additional microphone that can be used for gaming communication. At CeBIT 2012, Tt eSPORTS will also display the latest COMBAT WHITE series of gaming keyboards and mice. 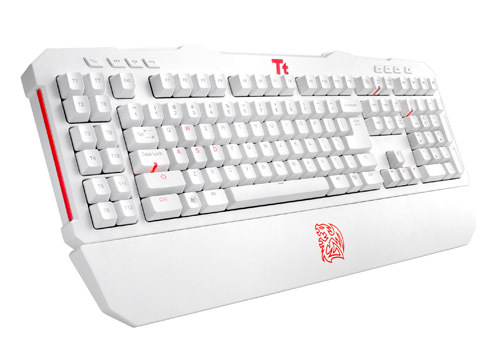 As a gesture to respond the current popular color trend ‘white’ in consumer electronic design, Tt eSPORTS will present keyboards MEKA G1 COMBAT WHITE and MEKA G-Unit COMBAT WHITE at CeBIT 2012 to reveal Tt eSPORTS’ different appearance. 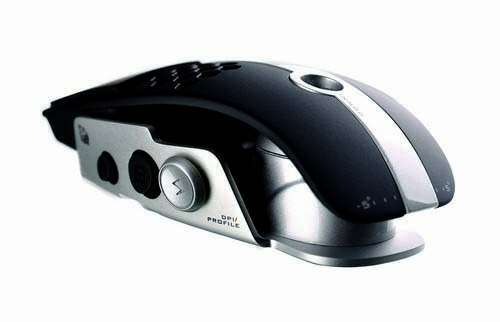 Also, BLACK COMBAT WHITE and BLACK Element COMBAT WHITE gaming mice are designed and promoted at CeBIT 2012 as a group of gaming system. Further, the design concept MILITARY GREEN series is set to offer war/battle gaming fans a perfect gaming product choice, with military green coloring on THERON mouse, MEKA G-Unit keyboard, and SHOCK headset, Tt eSPORTS booth at CeBIT 2012 is colorfully accessorized with absolutely energized representations of coloring that matches all games and users’ personality. 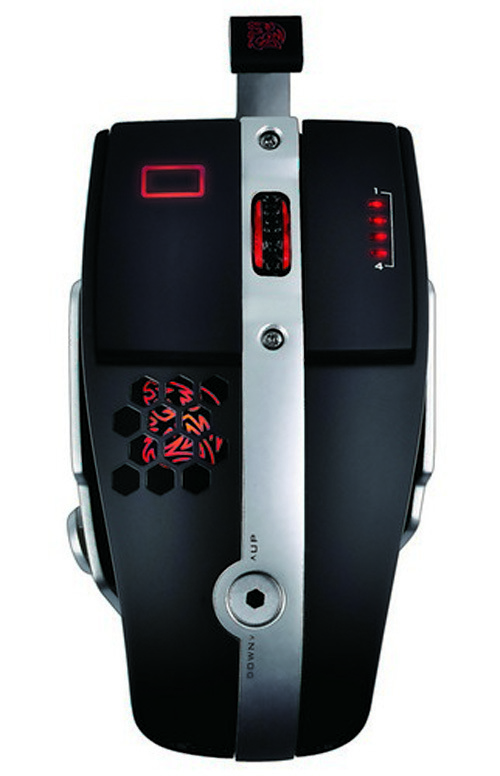 The year 2012 is also a milestone for Tt eSPORTS as we officially present SAPHIRA and THERON gaming mice, endorsed by the worldwide famous StarCraft2 players - Aleksey “White-Ra” Krupnyk, and Tt APOLLOS’s StarCraft2 player – SoftBall. And of course, both will be displayed and introduced at CeBIT 2012 to demonstrate that Tt eSPORTS shares the same passion and value with all players around the world, by taking care of the customers’ needs with cutting-edge technology, and with eSports gaming characteristic design. At this year’s CeBIT, LUXA2 will showcase its current extensive product line of mobile device holders, Apple product accessories like protective and functional cases and sleeves for iPhone and iPad. 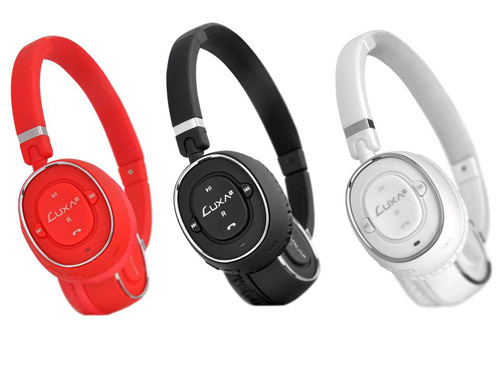 In addition, LUXA2 will also present its latest Bluetooth headphones BT-X3. LUXA2’s goal is to become the go-to resource for any individual living a mobile lifestyle. LUXA2 will launch the BT-X3 Bluetooth Stereo Headphone with Built-in Microphone. 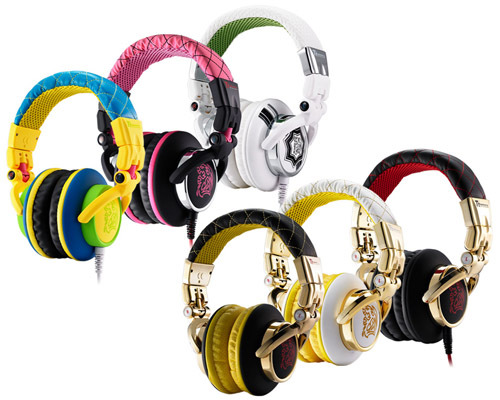 This headphone is perfect to be used with iPod, iPhone, Android phones and other smart mobile devices. LUXA2 designed this headphone for mobile phone users who want the best voice quality for calls and the best audio playback quality for music. This premium headphone delivers a high quality music listening experience, crystal clear in-call voice quality with wireless connectivity. This durable protective case has a detachable wireless laptop style keyboard with Bluetooth 2.0V technology, and the build-in lithium-ion rechargeable battery gives you 100 days of standby time and 90 hours of continuous usage time. Combined with durable construction, fast-response keyboard and sleek design, it is a must-have solution to people who like to type on their iPad 2 on the go, all the time! Modica Case : LUXA2 uses patterns inspired by our mother nature, such as leaf and weaving patterns for the design of Modica Case. Aside from its unique patterns, this case is very slim and lightweight with only 0.8mm in thickness. Fashioned from super durable and high-grade polycarbonate, Modica is a slender protective case with patterned golden details. Lille Case: The smart design of Lille Case gives you access to ‘slide-to-answer’ and speaker without opening the case. You can answer calls with more convenience. Its slim design protects iPhone 4S from scratches without adding bulk to your device. The special adhesive film in the phone keeps your iPhone in place while you enjoy your favorite app. This portable battery has 7000mAh capacity. It is an ultra-portable backup battery that will charge two devices simultaneously, without the need for an AC outlet or multiple backup batteries. This battery provides up to 220 hours of power, that's enough juice to fully charge an iPhone about 3.5 times, or to charge an iPad 78%. Apple authorized USB cables are included to charge iPhone and iPad. P1 7000mAh High Capacity Battery & Charger is what you need to stay powered all the time!